Goodness, I’ve been so busy lately with the Simplify Life Planner and Simplify Health team, that I haven’t really been making time to sit down and write much. It occurred to me today that I really do miss you all (and if I’m lucky, you miss me, too!). It’s a little funny how all the other little things that make up blogging take you way from, well, actually blogging! Anyway, I wanted to stop in for a few moments tonight and share some things with you. First, some of you all have noticed some slow changes here on the blog. The Simplify Mommyhood name has gone, and we’re now focusing on Dani Schnakenberg Studios. I’m wanting to focus what I share with you all just a little bit more and am stepping out of the “mommy-blogger” shoes. You’ll be seeing fewer recipes and kid things, and a heavier emphasis on all around personal-wellness. You’ll find out a little bit more about the why behind that later. I’m also reopening up my print and graphic design business and we’ve added some awesome new members to Dani Schnakenberg Studios. Okay, so why all the changes? Well, this has been a long long loooooong year for me, and when I haven’t been running around crazy moving us across 5 states with less than a month’s notice or chasing four little kids around, I’ve actually had quite a bit of time to think, and ponder, and plan. For those that don’t know me well, I’m big on planning. I’ve had time to reflect back a little on what has and hasn’t worked for us this year and paid close attention to what our areas of focus have been and what areas of our lives are desperately needing more of our attention. With all of this thinking and reflecting going on, I’ve ended up with some really clearly defined goals for 2014. The overall theme of them has been to live an intentional life. I had the same overall theme this year, and it worked out pretty well for me, so I think I’ll keep it. So let’s take a minute here and talk about the big picture: why is it important to live an intentional life? No matter your spiritual beliefs, I think we can all agree we’re here to have a purpose in our life, and I don’t think it’s to wander aimlessly through it and hope we have a positive impact on someone. So many of us live everyday in survival mode, and that’s just not doing us or our loved ones any good. What happened to our desire to thrive? It’s been deadened in a lot of us. We’ve become content to just survive. Well, I don’t want that. I don’t know about you, but I’m tired of being busy 24/7 and having next to nothing to show for it. Over the past few months I’ve made an intentional effort to slow down, and guess what? I’m getting more done. I’m seeing more of my plans come to fruit. Sounds almost unreal doesn’t it? I’ve taken more time off in the last four months than I’ve taken off in the last four years. And guess what? It’s had a direct correlation to the number of goals I’ve achieved. I’ve become more efficient and more productive. All because I’ve become more intentional and focused. 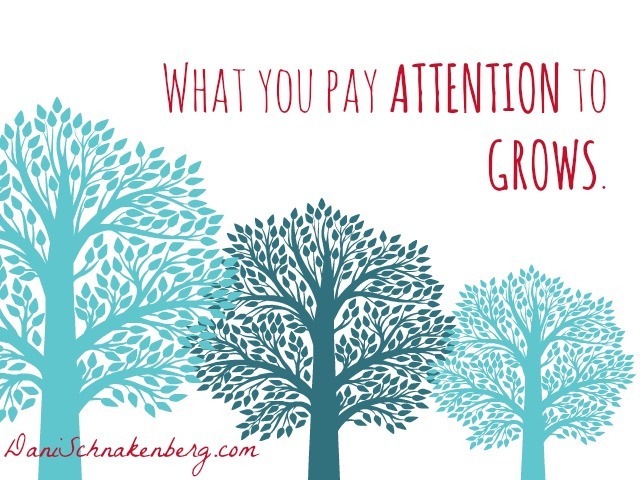 So what do you need to pay attention to in your life? 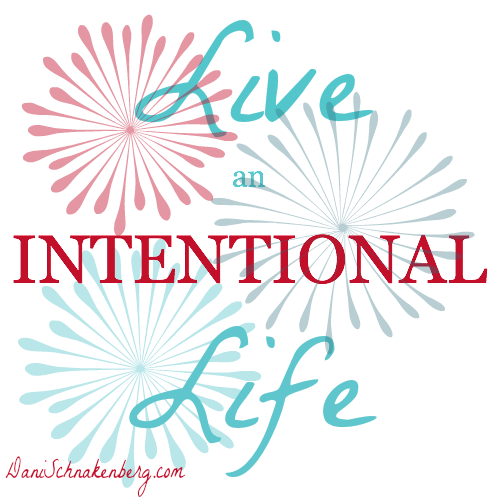 What areas of your life could use a bit more intentionality? I have been paying attention and implementing more healthy things, but I really need it to be my intention, everyday, every minute. This is an area my husband and I have chosen to refocus attention on as well. We’ve transitioned our family over who clean eating for the most part this year, but it’s time we showed more intention with our individual health, too. Beautifully said Dani! I would love to hear what areas of your life you will be focusing on more in 2014. I for one am pleased with your decision to step away from the mommyhood name and some of that focus. Unfortunately, I do not have kids (not infertility but other circumstances health and otherwise), even though I have always wanted to be a mom as long as I can remember. I’m still sort of processing the fact that, at 37, things are probably not going to change, so often I get to feeling “left out” with all of the mommy focused/named blogs and other things. I came to your blog because of the organizational focus, although it’s not like I don’t like recipes and other homemaking types of things 🙂 Thanks! !